Alachua County purchased the Weseman Tract property for the purposes of both relocating the existing Alachua County Fairgrounds and developing a new Industrial Park. CHW has been involved in ongoing master planning efforts for the Fairgrounds portion of the site. CHW prepared the Planned Development (PD) Zoning Master Plan and related document that now governs the Weseman Tract and the Resource Recovery Park component of the site. CHW recently received Final Development Plan approval for the Resource Recovery Park portion of the project. CHW has worked closely with Alachua County staff to incorporate feedback from extensive stakeholder interviews and research. In addition, CHW has collaborated with County staff to ensure consistency with the PD Zoning Conditions. The plan calls for the existing site wetlands to be preserved and buffered from development. Gopher tortoises currently residing on site are to be relocated to a dedicated conservation area adjacent to the Fairgrounds site. The proposed program for the Fairgrounds includes an 86,808 SF Auditorium, a 37,155 SF Livestock Arena, tent pads, a 5+ acre Events Lawn, Administrative Offices, main entry drive and vehicular parking accommodations. The project construction budget was set at $25,000,000. 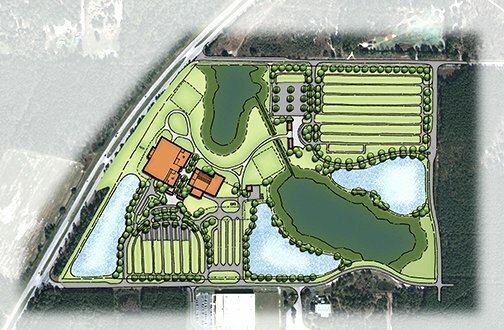 CHW was the civil engineering and landscape architecture sub-consultant to the Alachua County Fairgrounds Master Plan project and was responsible for the conceptual site plan development and layout, and preparation of presentation graphics/materials.